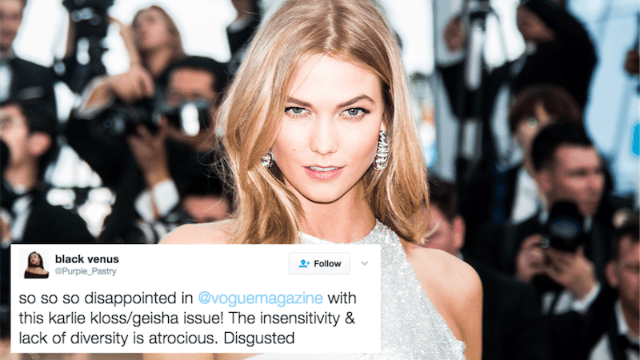 Vogue's latest "diversity" issue features Karlie Kloss as a geisha. File this one under: "will we never learn?" Vogue's newest issue, which is meant to champion the "Modern American Woman," was already taken to task for its weak attempt at a diverse cover, especially for its light-skinned color palette and treatment of plus-size model Ashley Graham (many thought it strange that she was the only model with her hand down and that it was done to cover up her thigh). And after an inside look at the issue, there's yet another botched effort of inclusivity and multiculturalism in the form of Karlie Kloss dressed as a geisha, The Cut reports. This was a very bad idea! It is literally crazy to imagine smart people who have dedicated their lives to making magazines and covering culture looking at these spreads and saying to themselves, "send these off to the printer, the world is going to love this!" It is cultural appropriation at its worst. Vogue took a famous white model, gave her long, black hair extensions and put her in a spread with a sumo wrestler. Clearly, they should have cast a Japanese model for this role, instead of Kloss, if they were so intent on doing a spread in Japan and highlighting traditional Japanese culture. And why Kloss would agree to the shoot is another question. Ultimately, I have no idea how this magazine piece came to exist because the idea should have been shot down so many stages ago by so many different people. And yet, here it is. Another tone-deaf and oblivious feature by an elitist magazine in which they plucked out their favorite aspect of a culture so that a white person could try it on, thereby destroying the essence of what the culture represents—its people. This is just one more of many insensitive choices that Vogue has made when it comes to cultural appropriation. The Cut notes that French Vogue once shot model Lara Stone in blackface, and the Vogue Italia site once featured a photo of earrings described as "slave earrings." ALL OF THIS IS BAD.